The Patriot is a solid Mel Gibson film that also showcased an up and coming talent that was Heath Ledger. Why are we so fascinated by war? Time after time movies depicts historical battles with dramatic flair and an increasing level of blood and violence. If you were to Google movies about World War II I'm sure there will a plethora of films listed and probably the same for the Revolutionary and Civil wars. 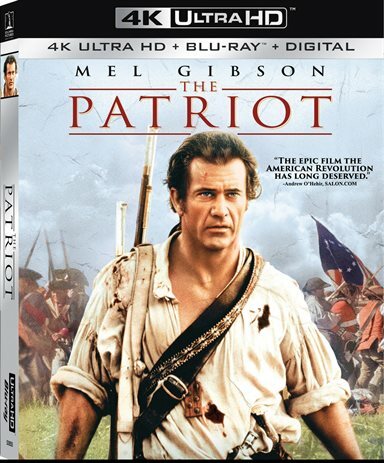 Once such film was 2000's The Patriot starring Mel Gibson (Lethal Weapon). As one of the latest films to get the 4k treatment it seems to lend itself to this new technology. Benjamin Martin (Gibson) is a simple farmer living with his family in South Carolina in 1776. The times are volatile as the Colonies are just beginning their revolt against the King of England. However, in a previous life, he was a soldier…an excellent one whose reputation precedes him. When he is asked to serve as an officer in this new war he declines and manages to stay home with his family until the War literally ends up on his doorstep. He stands helpless as a British officer kills his young son Thomas (Gregory Smith; Everwood) and takes his older son Gabriel (Heath Ledger; The Dark Knight) off to be hanged. No longer able to sit idly by, Martin gathers a civilian militia and quickly starts ambushing and killing the British. Over time he garners a reputation as a "Ghost" bolstering others to help the Colony's cause. However, when Col. William Tavington (Jason Isaacs; Harry Potter series) under unofficial orders of General Cornwallis (Tom Wilkinson; The Full Monty), takes drastic measures to stop the rebels, Martin and Gabriel seek revenge. While their actions have consequences they manage to turn the tide of the war and defeat the British Army after years of devastating losses. For Martin though the cost has been higher than he ever could imagine. The Patriot has some positive things going for it including an excellent cast. Gibson is at his best in this movie and reminds us when he was top among dramatic/action stars. A young Ledger proves he more than just a pretty face offering a solid performance of a young man with conviction. Isaacs is as evil as he is in the Potter series and makes the audience despise him from the onset. Chris Cooper (Adaptation) and Joely Richardson (Nip/Tuck) are excellent in supporting roles. The 4K Blu-ray is shown in 2160p/HEVC high definition and the movie benefits from this new format. The details are more definitively pronounces and the quality is sharp and clean. The Dolby Atmos audio is excellent and showcases the robust and full John Williams' penned soundtrack beautifully. The sound effects are deep and make use of the full sound experience. The audience is immersed in this battle aurally and surrounded on all sides. There are limited extras housed on the regular Blu-ray and are ported over from the 2000 release. They include The Art of War and The True Patriots. The 4K has other extras including Director & Producer Commentary, 7 Deleted Scenes with Commentary, Three Featurettes: The Art of War, The True Patriots and Visual Effects Interactive, Conceptual Art to Film Comparisons, Photo Galleries and Theatrical Trailer. While The Patriot offers a view of the tragedies of war and the sacrifices made, it most definitely takes dramatic license. It is also incredibly and unnecessarily long clocking at 165 minutes. With a talented cast it doesn't drag on as much as it could but it still could have been cut down to a little over 2 hours and it wouldn't have missed much of what was cut out. It's a solid Gibson film that also showcased an up and coming talent that was Ledger. Download The Patriot from the iTunes Store in Digial HD. For more information about The Patriot visit the FlickDirect Movie Database.